Community grocery stores are being revived to provide a local service in small Kansas towns, where, as in many rural areas, powerful box box retailers have opened up some distance away and scooped up their trade. Business watchers report that the tide is turning in the Wheat State’s food deserts, the areas in which customers are at least ten miles from a grocery store. The inconvenience is greatest to the elderly and less mobile. After 2007, when Kansas had 213 rural grocery shops, 45 communities lost their stores, so that about 800,000 people were left in food deserts. “When a grocery store in a small town dies, the town dies,” said Yvonne Scott, healthy food access co-ordinator of AmeriCorps VISTA, a national program formulated to relieve poverty, based on a 1960s proposal from President Kennedy. Some campaigners have pooled resources to establish community-owned stores; others have created co-operatives to start shops. In other towns local councils have joined residents to set up partnerships with some public money to run stores. In Kiowa, Barber County, a co-operative manages the new store, and in Little River, Rice County, the city government and a community foundation have combined for the purpose. In Plains, Meade County, local activists intend to open a non-profit grocery business next year. Loren Lance, who took over a closed community store in Mildred, Allen County, with his wife Regena, says he is thanked by at least one customer every day for keeping the service going. 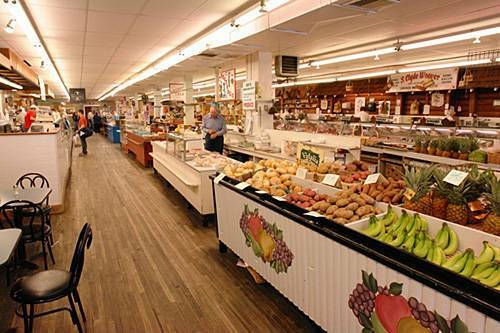 “There are lots of innovative things that people are doing to try to either start or sustain their local stores,” said David Procter, director of Kansas State University’s Center for Engagement and Community Development, which tracks the closure of small town groceries and offers business advice to communities and shop owners. The result of these local initiatives is that at the last count Kansas had 193 rural shops, almost the same number as in 2007. The government estimates that 55 million Americans live in food deserts. Could Kansas be a model for other states?